Vladimir Tarasenko nets PPOTN honours after a three-point effort in St. Louis’ 4-3 win over Chicago in Game 4 of their Western Conference matchup. 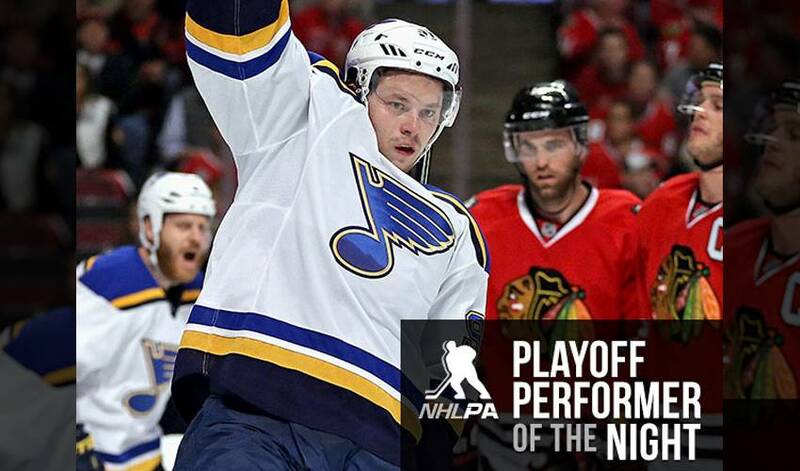 The 24-year-old had two tallies and one assist, as the Blues took a 3-1 series lead over the Blackhawks. STAT PACK: Tarasenko had five of the Blues 20 shots, dished out three hits, had one takeaway, and took 27 shifts in 15:14 of ice time. SHARING HIS SECRET? “I don't know how he shoots the puck like that," said captain David Backes of Tarasenko. "I wish he'd tell me his secret. But he's a talent." IT’S ALL IN THE WRISTS: Both of Tarasenko’s goals came courtesy of wrist shots, the first coming in the opening period, the other in the second frame. HIGH FIVE! : Tarasenko has three goals and two assists so far in the series. LIKE FATHER, LIKE SON: Tarasenko’s father, Andrei, was a standout player in Russia and represented his country at the 1994 Winter Olympics. Vladimir won gold with Russia at the 2011 World Junior Championships. A ONE-TWO PUNCH: On January 19, 2013, in his first NHL game, Tarasenko scored his first NHL goal on his first shot, a breakaway marker courtesy of a wrist shot. He followed it up with another tally on his second shot of the game. ON THE OFFENSIVE: Tarasenko, who matched a career high for points in a playoff game (also Game 2 of 2015 FR vs. MIN: 3-0-3), has scored 13 goals in 17 career post-season contests (13-3-16). He has registered at least one point in eight of his last 10 meetings vs. Chicago dating to Feb. 8, 2015 (9-4-13). HATS OFF TO No. 91: On October 28, 2014, Tarasenko scored his first NHL hat trick, the trio of goals coming against Dallas. HONOURABLE MENTIONS: Nikita Kucherov had two goals and one assist in Tampa Bay’s 3-2 win over Detroit. Frederik Anderson turned aside all 27 shots he faced, including 13 in the third period, as Anaheim blanked Nashville by a 3-0 count.